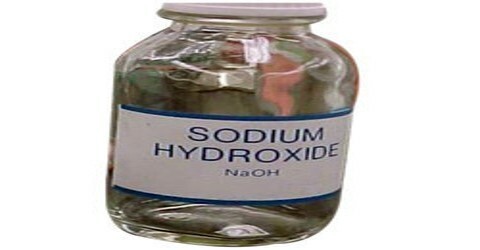 Sodium hydroxide is toxic and strongly alkaline and is used to make chemicals and soaps and to refine petroleum. It is a white, corrosive, solid compound that absorbs water and carbon dioxide from the atmosphere and forms lye when in solution. It is a highly caustic base and alkali that decomposes proteins at ordinary ambient temperatures and may cause severe chemical burns. It is highly soluble in water and readily absorbs moisture and carbon dioxide from the air. It forms a series of hydrates NaOH·nH2O. 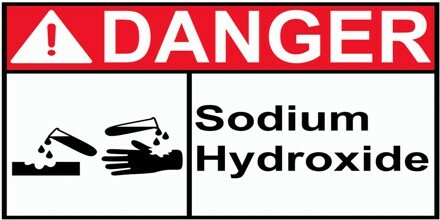 Sodium hydroxide is very corrosive. It is generally used as a solid or a 50% solution. Other common names include caustic soda and lye. Sodium hydroxide is used to manufacture soaps, rayon, paper, explosives, dyestuffs, and petroleum products. It is also used in processing cotton fabric, laundering and bleaching, metal cleaning and processing, oxide coating, electroplating, and electrolytic extracting. 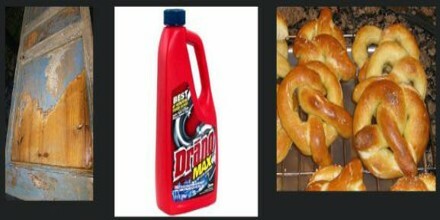 It is commonly present in commercial drain and oven cleaners. 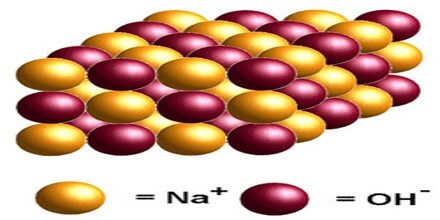 Mercury Cell Process – sodium metal forms as an amalgam at a mercury cathode; this sodium is then reacted with water to produce NaOH. There have been concerns about mercury releases, although modern plants claim to be safe in this regard. Diaphragm Cell Process – uses a steel cathode, and reaction of NaOH with Cl2 is prevented using a porous diaphragm. In the diaphragm cell process the anode area is separated from the cathode area by a permeable diaphragm. The brine is introduced into the anode compartment and flows through the diaphragm into the cathode compartment. Diluted caustic brine leaves the cell. The caustic soda must usually be concentrated to 50% and the salt removed. This is done using an evaporative process with about three tonnes of steam per tonne of caustic soda. The salt separated from the caustic brine can be used to saturate diluted brine. The chlorine contains oxygen and must often be purified by liquefaction and evaporation. Membrane Cell Process – similar to the diaphragm cell process, with a Nafion membrane to separate the cathode and anode reactions. Only sodium ions and a little water pass through the membrane. It produces a higher quality of NaOH. Of the three processes, the membrane cell process requires the lowest consumption of electric energy and the amount of steam needed for concentration of the caustic is relatively small. An older method for sodium hydroxide production was the LeBlanc process, which produced sodium carbonate, followed by roasting to create carbon dioxide and sodium oxide. This method is still occasionally used. 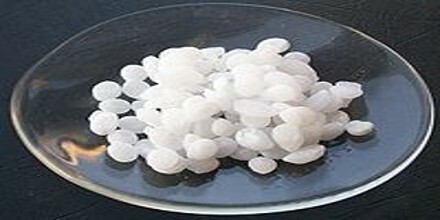 It helped to establish sodium hydroxide as an important commodity chemical. Sodium hydroxide is used in many scenarios where it is desirable to increase the alkalinity of a mixture, or to neutralize acids. Around 56% of sodium hydroxide produced is used by industry, 25% of which is used in the paper industry. It is a very common base used in the chemical industry and is used for many things, many of which occur in our daily lives. Solvation of sodium hydroxide is highly exothermic, and the resulting heat may cause heat burns or ignite flamables. The combination of aluminium and sodium hydroxide results in a large production of hydrogen gas: 2Al( s) + 6NaOH(aq) → 3H2(g) + 2Na3AlO3(aq).